I've never been much of one for business-type books; I generally find that as much as I like an idea behind a book, I have the attention span for about 20 pages of it... and from there, it just gets repetitive, overly detailed, or dull. Or all of the above. But when I was offered a review copy of the new audiobook version of How: Why How We Do Anything Means Everything, I was intrigued. And not just because President Bill Clinton wrote the introduction, though that certainly didn't hurt. How turned out to be a little bit of what I expected from a business book (overly detailed and repetitive at times), but more interesting than your standard "this-is-how-to-do-it" kind of read. 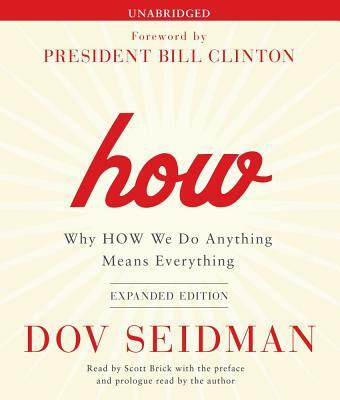 Because in fact, it is anything but a "this-is-how-to-do-it" read, and Dov Seidman is clear about that from the get-go. How is not a how-to, but a caution to think about how you act, how you behave, and how you make decisions--an invitation to understand the impact of how you do something, as much as what you do. Though perhaps not the most groundbreaking book you'll listen to all year, the audio version of How is a worthwhile listen for those interested in taking a different stance on business reading. Don't expect a how-to manual on doing the right thing or being the right kind of leader or worker or decision maker; instead, expect to reconsider a few things you've always taken for granted, and get some interesting stories on human nature -- and varying business cultures -- along the way. It's the kind of business sociology book that can be applied in business as much as in everyday life, and I believe that's what makes it more compelling than a standard how-to (or how-not-to) read, as the case may be. And as an added plus, narration by Scott Brick is spot-on. Note: Thanks to the publisher, Simon and Schuster Audio, for a review copy of this book.